The tiny moon: With an estimated diameter of 8 to 21 miles (13 to 34 kilometers), P4 is the smallest moon discovered around Pluto. By comparison, Charon, Pluto's largest moon, is 648 miles (1,024 kilometers) across, and the other moons, Nix and Hydra, are in the range of 20 to 70 miles in diameter (32 to 113 kilometers). These two images, taken about a week apart by NASA's Hubble Space Telescope, show four moons orbiting the distant, icy dwarf planet Pluto. The green circle in both snapshots marks the newly discovered moon, temporarily dubbed P4, found by Hubble in June. The new moon lies between the orbits of Nix and Hydra, two satellites discovered by Hubble in 2005. It completes an orbit around Pluto roughly every 31 days. The moon was first seen in a photo taken with Hubble's Wide Field Camera 3 on June 28, 2011. The sighting was confirmed in follow-up Hubble observations taken July 3 and July 18. 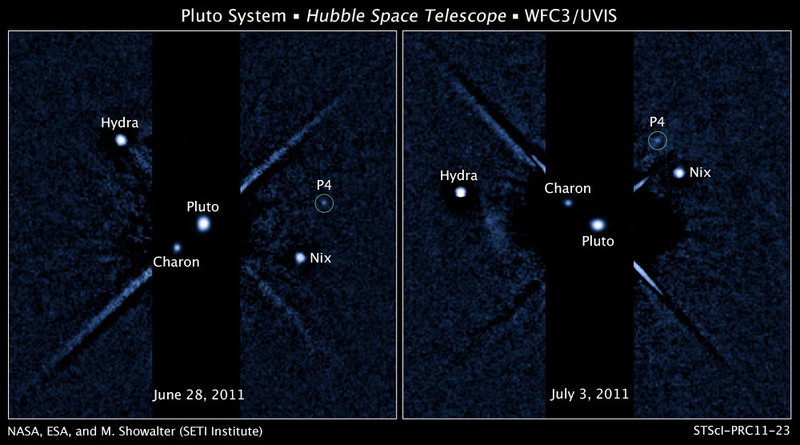 P4, Nix, and Hydra are so small and so faint that scientists combined short and long exposures to create this image of Pluto and its entire moon system. The speckled background is camera "noise" produced during the long exposures. The linear features are imaging artifacts. The tiny satellite was uncovered in a Hubble survey to search for rings around the frigid dwarf planet. Signs of the new satellite in the June-July 2011 images also sent the observing team – which includes Stern, Hal Weaver of the Johns Hopkins University Applied Physics Laboratory (APL) in Laurel, Md., and Andrew Steffl and Leslie Young of Southwest Research Institute – combing though older Hubble snapshots. Knowing where to look, Weaver found strong evidence for P4 in images from June 2010. Steffl saw the same in a set taken in February 2006. Together these “archival” records add to the available suite of data needed for scientists to accurately determine the moon’s orbit. 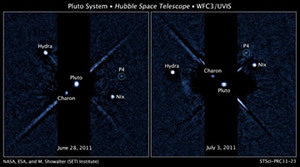 Charon got company in 2005, when a team led by Weaver and Stern found two smaller moons – subsequently named Nix and Hydra – again using Hubble. This discovery also suggests other small bodies may lurk in the Pluto system – and, if so, New Horizons should root them out when it flies by. But more “targets” might not be the best thing for the mission.“The discovery of P4 is exciting, but it also raises the possibility that our New Horizons spacecraft may enter a more hostile environment than we previously imagined,” says Glen Fountain, New Horizons project manager from APL. New Horizons launched on Jan. 19, 2006, picking up a gravity boost from (and conducting scientific investigations of) Jupiter in February 2007. The spacecraft is now more than 1.8 billion miles (2.9 billion kilometers) from Earth, on course to fly past Pluto on July 14, 2015, then on to one or more other Kuiper Belt objects in a possible extended mission. The Johns Hopkins Applied Physics Laboratory built and operates the New Horizons spacecraft and manages the mission for NASA; Stern leads the mission as principal investigator.